The Goelet A.C. Beuf Community Center is a high-quality, relatively low-cost City of Phoenix facility with meeting rooms and a full gym. It is open to residents and non-residents (non-residents pay higher fees). It sits within Paseo Highlands Park, an outdoor facility, at 3435 W. Pinnacle Peak Road, just west of I-17. Pricing: Purchase of an annual Phoenix Parks and Recreation pass is required to register for programs and activities. Pass is $20 annually for Phoenix residents ages 18 and up; $5/youth residents 3-17. Non-resident fees are $40 annually for ages 18 and up; $10/non-resident youths ages 3-17. More Info: Go straight to the city’s Beuf website for hours, current list of classes and other details. Or see more info and photos of the facility below. The 43,000-square-foot indoor facility houses a full-size gymnasium with six regulation-size baskets, a balcony track that circles the gym, and a small, but well-equipped weight room. 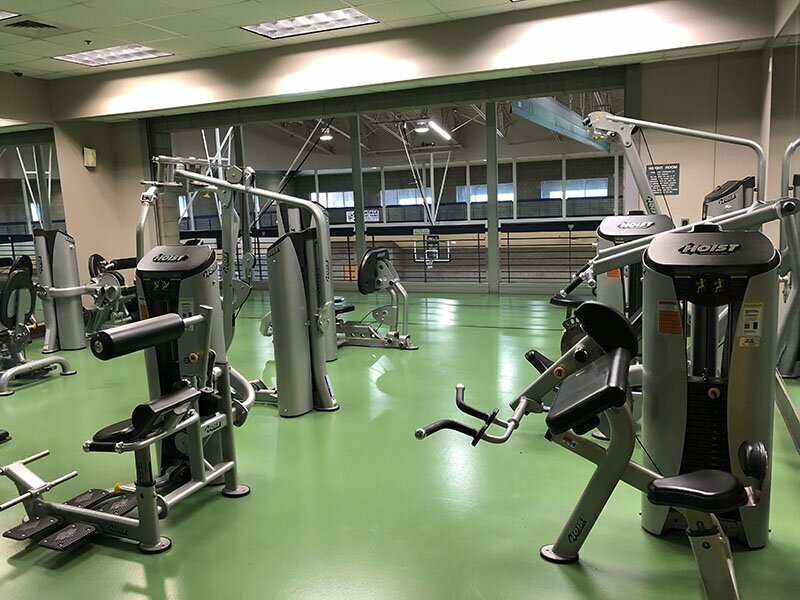 There’s also an aerobics room with treadmills and exercise bikes, a computer lab, a lounge with restrooms and showers, game room, and a dance and exercise room. Outside you’ll find a kids playground, sand volleyball court, multiple ball fields and eight lighted pickleball courts. Programming, in the form of fitness, sports and dance to piano and school readiness programs, occurs seasonally with several weeks of breaks in between sessions. The name? Some pronounce it byo͞of, some just say buff. The facility opened in 2003 and was named in memory of Phoenix Police Officer Alessandro Carlo Beuf, who died in the line of duty in the area. Beuf’s weight room is small but well equipped with machines and free weights. Treadmills and stationary bikes are in a separate room.